If you're looking to have your TV mounted to your wall or cabinet, don't hesitate to contact the experts at Adelaide Telefix. We have years of experience mounting televisions to walls, cabinets, and other areas in homes and offices. No matter what setup you have, we can mount your TV securely and to your liking - if you want your TV to swivel, or be on an angle, or you just want the TV mounted directly to the wall, we can do it for you. There are numerous advantages to having a wall mounted TV. A wall mounted TV takes up less room than a TV stand or table, and in areas where space is at a premium, this can be very important in utilising all of the available space as much as possible to get a great TV experience. Another advantage with wall mounting is that the TV can be mounted at the height that works best for you and provides the most optimal viewing distance, ensuring that you get the best viewing experience from your TV, and reducing the chance of neck strain or eye strain. 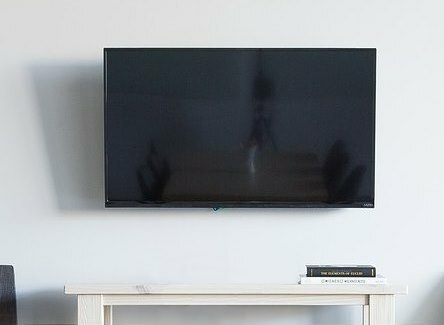 Mounting TVs to your wall can be dangerous to do yourself if you don't have the right experience and equipment to do it properly - you may hurt yourself, or the TV may not be completely secure and could fall off and cause damage to itself or the surrounding area. Having the professionals at Adelaide Telefix mount your TV for you means you can have peace of mind knowing that your TV will be mounted securely and to your liking. Once your TV is mounted to the wall, you'll also want to make sure your TV is getting the best reception so you can watch your favourite channels. Our team can advise you on the best TV antenna for your situation, install the TV antenna for you, and tune your TV so you get the best reception and quality for all of your channels. So if you're looking to get your TV wall mounted, contact us now on 1300 884 829 for a free quote, or contact us online by clicking below. Telefix in Adelaide provides TV wall mounting, TV tuning and other services throughout the Adelaide metro area.